Lyle joined our flock in the Fall of 2013, hailing from the Moose Mtn. flock in Colorado. He is 4-horn lilac ram with one of the most exquisite Jacob fleeces I've yet encountered--long, very open, silky, and crimpy. 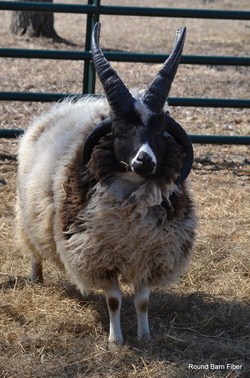 He has a lovely horn-set and a mild personality. Lyle was the Champion Winter Ram Lamb at the 2013 Jacob Sheep Breeder's Association AGM.